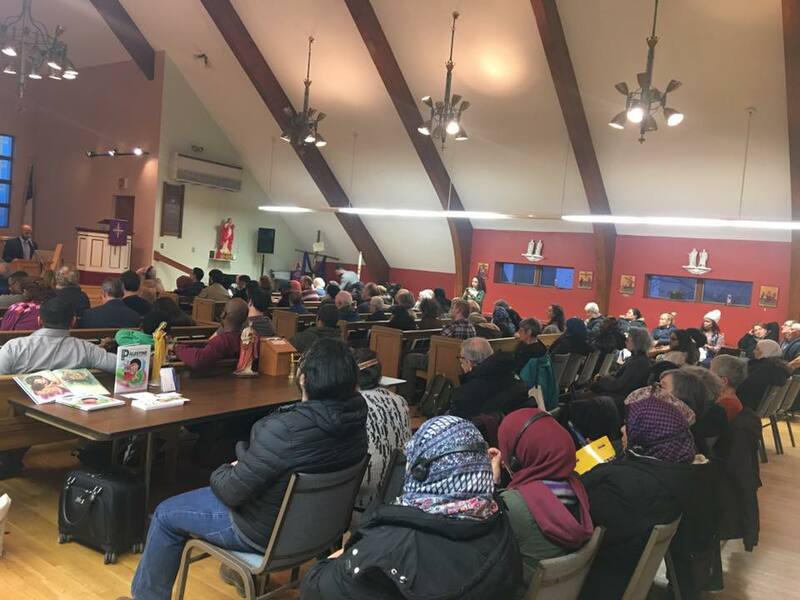 New York, NY March 13 — Tonight NWU joined with the Arab-American Association of NY (AAANY) and the Arab-American Family Support Center (AAFSC) for a panel on ending the war and humanitarian crisis in Yemen. The event was also sponsored by Jewish Voice for Peace, Brooklyn Peace and the International Committee of the Professional Staff Congress, which represents CUNY teaching staff. Yemen has been under siege since 2015, trapped in a civil war and thousands of bombing missions carried out by Saudi Arabia and the U.S., targeting infrastructure, schools and hospitals. In this country of 27 million, 10,000 have been killed, 2 million have been displaced, more than 14 million do not have access to clean water and sanitation, and many millions are on the brink of starvation. Yemen is now the center of the greatest outbreak of cholera in history. NWU President Larry Goldbetter emceed the event and spoke about the attacks on media workers and journalists in Yemen. He was followed by Dr. Golbarg Bashi, the feminist scholar, Middle East expert and the author of the children’s book, “P is for Palestine.” She gave a brief history of the conflict in Yemen and spoke about the link between gun violence in the U.S. and the tens of billions of dollars in weapons that are sold to Saudi Arabia to carry out these war crimes. There were also speakers from Yemen Aid, AAFSC and the NY City Commission on Human Rights. During the Q&A, a woman with a group of people from Make the Road NY (the event was translated in English, Spanish and Arabic), spoke about an upcoming visit to NYC by the Saudi Crown Prince. She asked if she could count on everyone there to come out and protest his visit, and got a resounding “Yes!” by the 100 in attendance.